Sandy Martin knew at a very early age that she wanted to be an artist. She made her first oil painting at the age of thirteen. As an excited and enthusiastic sixteen year-old, Sandy, along with three friends, obtained a large studio in downtown Wakefield, Massachusetts. After earning her BFA in Art from the University of Massachusetts, Sandy was selected from over 200 young competitors to be an apprentice at the Romany Gallery on Bearskin Neck, Rockport, Massachusetts. From 1974- 1978, Sandy was one of the owners of the Dream Merchant Gallery on Main Street in Rockport. She was fortunate to study with some of Rockport’s greatest artists, including Paul Strisik (1918-1998), nationally renowned Plein Air artist. Strisik was a major influence on Sandy’s landscape painting. She also had the opportunity to spend winters in NYC and study at the Art Students’ League as well as privately with some of the world’s most respected oil painters. At the age of thirty, Sandy gave up the retail side of art to have a family, but never for a minute did she give up painting. After having two daughters, Sandy turned to watercolor so that she could safely paint around her young children. Prints of her Boston Skyline watercolor were sold though the Harvard Coop, and the piece was chosen by Leonard Nimoy as a set design for his film The Good Mother (Touchstone Pictures, 1988). Sandy continued painting, with successes that included illustrations projected during a symphony performance of Saint-Saëns’ Carnival of the Animals. Four years ago, Sandy Martin began the study of Impressionist Watercolor Painting, a technique that came from Australia, with world renowned artist Alvaro Castagnet. She rejoins him yearly to continue her studies. 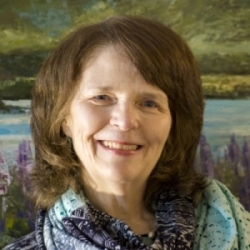 Sandy uses various media, including oils, watercolor, pastel, acrylic, and photography. In 2015, she developed a patent-pending technique called Impressionist Watercolor Imagery that combines black and white photographic images with hand painted watercolor. Many of her themes revolve around life in a small town and the beautiful natural surroundings of New Hampshire’s Lakes region, including Lake Winnipesaukee. In 2009, Sandy Martin and her husband Ashton Woodhouse opened the Sandy Martin Gallery, 15 South Main Street, Wolfeboro, NH. Every year on the Saturday of Memorial Day weekend, the Sandy Martin Gallery hosts an Open House from 4pm-6pm. There is live music and a wine social. The public is invited to participate, meet the artists, and enjoy the festivities.